Published: Jan. 8, 2018 at 01:53 p.m. Updated: Jan. 9, 2018 at 10:59 a.m.
Finding money in a jacket you haven't worn in a while. Getting a call from a friend you haven't connected with in years. Having that late round draft flier or waiver wire pick turn into one of the highest-scoring players at their position. All are pleasant surprises. Below are a few more pleasant fantasy surprises from 2017. For years, Smith has been the fantasy football equivalent of a generic whole grain cereal. It's not the greatest thing in the world -- it doesn't have the appeal of a donut or the sizzle of bacon -- but you won't starve to death, either. Except this year, someone kicked the cereal up a notch by adding some fruit and turning it into a smoothie. Alex Smith looked like a different quarterback, throwing the ball deep and racking up fantasy points. 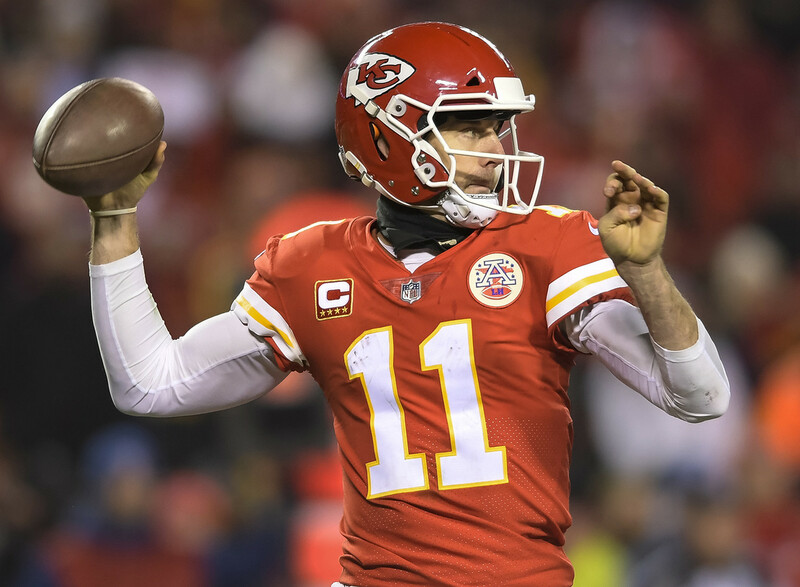 Never in anyone's wildest dreams did they envision Alex Smith would end the season as the QB4. Maybe cereal ain't so bad after all. Mark Ingram had a career year in 2016, cracking the 1,000-yard rushing mark and scoring double-digit touchdowns for the first time ever. His reward was to end up in a crowded backfield with veteran Adrian Peterson and rookie Alvin Kamara. Funny thing about that backfield, though ... it was crowded until it wasn't. Peterson was traded to Arizona and things opened up. Nothing in the known fantasy football universe suggested that a middling veteran and a rookie with an uneven draft pedigree would become the hottest duo in New Orleans since red beans and rice. By the time the dust had settled, Kamara was the RB4 while Ingram checked in at RB6 with both having become weekly must-starts. Laissez les bon temps rouler! This time one year ago, plenty of observers had left Goff for dead. It made some amount of sense. His seven starts in 2016 did nothing to inspire confidence and even the prospect of a new head coach didn't spark a lot of excitement. What we didn't expect was that Sean McVay would be the offensive wunderkind that fantasy managers deserved. With a new offensive scheme that emphasized simplified decision making, Goff started to look like the player the Rams envisioned when they selected him first overall in 2016. It's almost like it takes some players time to adjust to life in the NFL. Speaking of the Rams ... Gurley's sophomore slump led many to believe that his rookie year was an illusion. Once again, enter Sean McVay and his magical fantasy offense. Suddenly, Gurley not only looked like the player who was a rookie sensation but actually took his game to another level. The talent was there for Gurley to put together a top 10 fantasy season -- possibly even top five -- but being the top scorer at running back (by a large margin)? Nope. Once upon a time, there was a narrative that said Tyreek Hill was too much of a boom-or-bust option to be a consistent fantasy threat -- especially with Alex "Checkdown Charlie" Smith running the offense. Alas, the Chiefs offense gave us all the proverbial middle finger by remaking itself into a high-octane, vertical passing offense that snuffed out a lot of the talk about Hill's limitations. After all, how much can you really criticize the WR4? For years plenty of fantasy managers has been riding the Marvincoaster ... and it was generally a frustrating trip. This year, the coaster leveled out a little bit with a few big climbs thrown in for good measure. After living in Golden Tate's shadow for a year, Jones finally broke out with his first 1,000-yard campaign in 2017. Was this year a fluke or the start of something bigger for Jones? Who knows? Let's just enjoy this year. We can worry about next year later. There was plenty of buzz about Thielen being a sleeper pick in 2017 but there weren't a lot of people anticipating that he'd outscore Mike Evans, T.Y. Hilton, Doug Baldwin or even his teammate Stefon Diggs. Instead, Thielen turned out to be one of the bigger stories of the fantasy (and NFL) season as he finished the year with the fifth-most receiving yards. Depending on how the Vikings address their quarterback situation in 2018, this team could become a gold mine for fantasy drafters. The tight end position brought more disappointment than surprise in 2017 but we'll always have Zach Ertz. The player who annually blossomed sometime in late November decided to become a perennial who showed up all season long. From Week 1 to the end of the season, Ertz was one of the most consistent players at a position that lacked consistency all year long. After spending a good portion of the season as the top fantasy tight end, Ertz ended the year as the TE3. Not bad at all. For years, we had projected that the Jaguars defense would be a monster. Most of the time we were left wanting. But in 2017, it finally happened. Sacksonville rose to prominence while the Jackson 5 led by Jalen Ramsey and A.J. Bouye made life miserable for opposing quarterbacks and receivers. The Jags posted four (FOUR!) 20-point fantasy outings this season and was by far the top scoring defensive unit in the game. With a young core that's only getting better, this group will be one of the first defenses drafted for the foreseeable future.